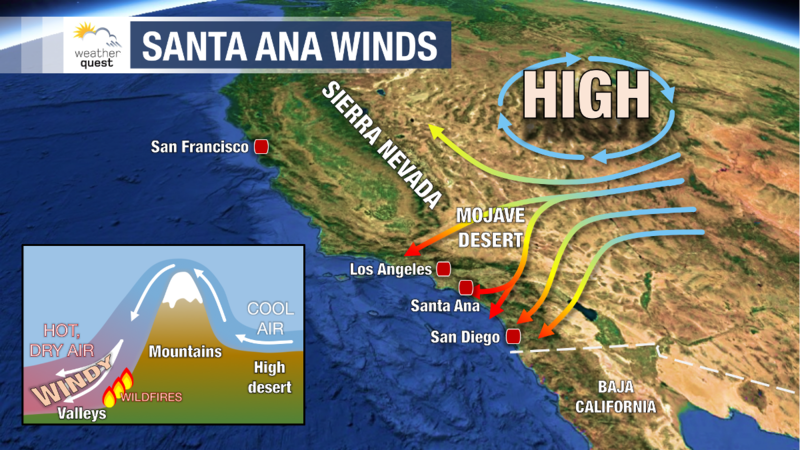 Santa Ana winds, also known as El Diablo winds, are "katabatic" winds, usually formed when high pressure sits over the Great Basin of the United States, and low pressure approaches the coast of California in the Pacific. This will often help to develop an easterly flow of air that moves from the higher elevations of the Sierra Nevada towards lower elevations near the coast of California. As this relatively cool, dry air over the Sierra Nevada moves westwards and lowers in elevation it is warmed adiabatically, and without the addition of moisture this lowers the relative humidity of the air, often below 10%. The winds also pass through various valleys and as they do they are "squeezed", thus increasing their their speed. Wind speeds can often reach 40-50mph. 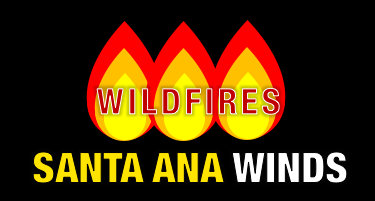 This combination of hot, dry air and strong winds increases the risk and spread of fires dramatically. These winds most commonly occur in Autumn, but can happen other times of year as well.